Prosecutors described as "heinous, egregious" the case of a 12-year-old girl found malnourished in her home weighing 35 to 40 pounds last January. The girl had received no medical care since she was 10 months old, never went to a dentist and did not get to go to school, the prosecutors added. 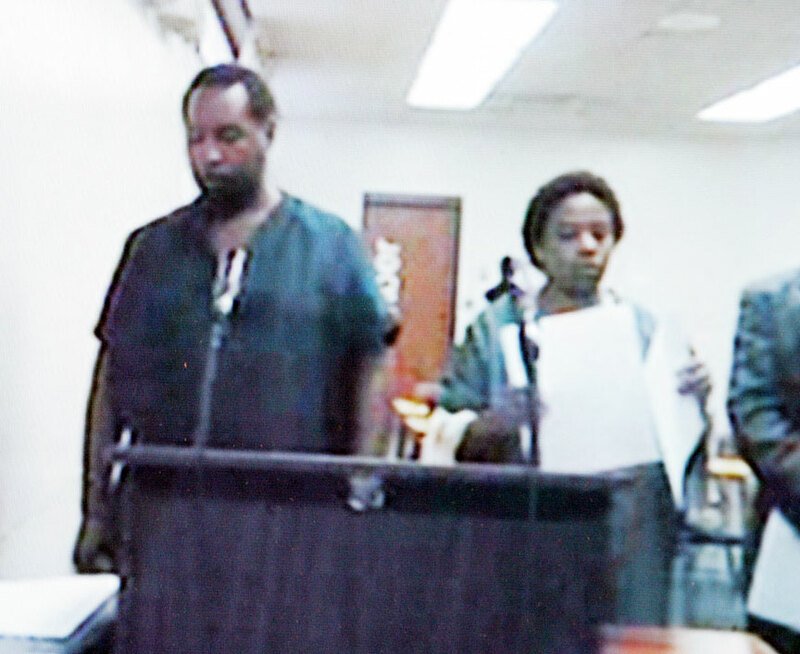 These grim details emerged yesterday as the girl's parents, Melvin and Denise Wright, pleaded not guilty to attempted second-degree murder. The trial is scheduled for Sept. 10, and both parents are in custody, with bail at $100,000 each. The pair was convicted of child endangerment seven years ago, when the girl, then 5, was physically abused. A 12-year-old girl found malnourished and unconscious in a Makiki apartment had not seen a doctor since she was 10 months old, did not attend school and never saw a dentist. Emergency medical services found the girl dangerously underweight and "basically at her deathbed" earlier this year before she was taken away from her parents, prosecutors allege. However, the parents, Melvin and Denise Wright, say they are not guilty of attempted second-degree murder. The parents appeared for their arraignment yesterday in Circuit Court via a videoconference from Oahu Community Correctional Center. "This is the most heinous, egregious -- I don't know what other adjectives you can use -- disregard of human life by anybody, parents or otherwise," Deputy Prosecutor Maurice Arrisgado said outside the courtroom. "I think the evidence in this case, when it's presented to a judge or jury, will show clearly that the charge of attempted murder is very appropriate." An Oahu grand jury indicted the parents on the charge after their daughter was found Jan. 7 in their Kinau Street apartment weighing about 35 to 40 pounds. Pediatricians have said a girl that age should be about twice that weight. Arrisgado said there is currently "absolutely no explanation" why the girl was left to deteriorate to such an emaciated state. The girl was taken to the Kapiolani Medical Center in critical condition. She was placed under foster care by the state after the Department of Human Services conducted an investigation into the incident. In court the pair opposed the presence of media cameras, which the judge had already approved. Denise Wright, 33, tried to hide from the field of view in the videoconference camera before the judge told her to reveal herself. Melvin Wright, 33, had filed for divorce shortly after their daughter was taken, because the marriage was "irretrievably broken." Before the arrests this month, the pair was already separated, according to divorce papers. The pair married in January 1995 and moved to Hawaii from Charleston, S.C., a month later. According to asset declarations, the husband, who earned about $1,400 a month as a parking lot checker, is the only source of income for the family. This is the second abuse case involving the family. In 2000 both parents pleaded no contest to endangering the welfare of a minor and received a year's probation. Court records indicate the girl was physically abused. The recent indictment alleges that the couple had failed to support and supply the medical care needed for the daughter since June 2006. "She's never seen a doctor since she was 10 months old," Arrisgado said. "Never been to a dentist, never been to a school as far as I know." 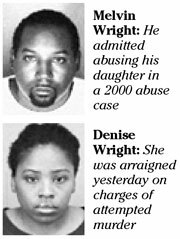 The Wrights' bail was confirmed yesterday at $100,000 each, and their trial was set for September. This was a rare case of an unreported child abuse case, said Aileen Deese, program director for Prevent Child Abuse Hawaii. "Usually in Hawaii, even though we live in a very private environment, there are many people around to report a case like this," Deese said. "Unfortunately, that didn't happen here." Deese reminds the public of red flags of child abuse, and to offer support to parents that appear to be having a difficult time raising a child. "Get to know the family and support them in any way," Deese said. "Parents need that social connection, and it sounds like this couple didn't have that."